The footage of President Obama strolling through the ancient ruins at Stonehenge was an apt bookend to the meeting of NATO, a Cold War relic that should have been abolished after the dissolution of the Soviet Union in 1991. But while hundreds of protesters marched through the streets calling for NATO to be dissolved -- "From Iraq to Ukraine, NATO only causes pain," they chanted -- NATO leaders saw the crisis in Ukraine as an opportunity to breathe new life into the moribund military alliance. The recent NATO meeting in Wales was supposed to be about how to wind down NATO's 12-year military adventure in Afghanistan -- without admitting the monumental failure of leaving behind a fractured, impoverished nation that can't even figure out who won the last election. Afghanistan, however, was barely mentioned. Nor was the disastrous NATO intervention in Libya that has resulted in a failed state rife with violence. And while there was some handwringing about how to deal with ISIS, it was clear most NATO countries did not want to join Obama in a new military quagmire. The meeting's main focus was the conflict in Ukraine, a conflict that NATO played a key role in creating. NATO broke the pledge. In 1999, it admitted three former Warsaw Pact countries: the Czech Republic, Hungary, and Poland. In 2004, it admitted Estonia, Latvia, Lithuania, Bulgaria, Romania, Slovakia, and Slovenia. Today the NATO security alliance covers 28 member states. It does not include Ukraine, but Ukraine is pushing for NATO membership. One does not have to sympathize with Putin's oligarchic authoritarianism or Russia's annexation of Crimea to recognize the West's intimidation. When Ukraine's corrupt but elected president was overthrown in a U.S.-backed coup, it was scarcely paranoid for Russia to see the takeover of the neighboring state as a threat to its core interests. Instead of seeking to reduce tensions, British Prime Minister David Cameron used the Summit to announce the creation of a new rapid-reaction force of 4,000 troops. The force, to be made up of troops provided by member states on a rotating basis, would be capable of deploying on 48 hours' notice to protect any NATO member from external aggression, which under the current circumstances means the Baltic States of Estonia, Latvia, and Lithuania. While NATO insists that is has no plans for new permanent bases in Eastern Europe, it announced that troops will be rotated to the region every four months, creating what it calls a "persistent" presence. The force will be supported with logistics and equipment, including weapons and fuel pre-positioned in Eastern European countries closer to Russia. This will be enhanced by more military exercises and air patrols, as well as exercises in Ukraine. And the U.S. government has already committed some $60 million to provide the Ukrainian military with items like night vision goggles, body armor, and communications equipment. Adding to Russia's sense of encirclement, NATO is also building missile interceptor shields. NATO insists this will be purely defensive and is intended to thwart any future missile attack by a rogue state such as Iran or North Korea. But Russia views NATO deployment of interceptor missiles and radars in Romania, the Czech Republic, and Poland as another form of intimidation. NATO's encroachment in Russia's backyard and its backing of the Ukraine government's bombardment of the eastern part of the country threatens not only a new Cold War, but an armed conflict between Russia and NATO-aligned countries. With Russia possessing thousands of nuclear weapons, the conflict could well spiral out of control. The protesters outside the summit were well aware of the danger. Russian activist and scholar Boris Kagarlitsky told the protesters said that while Putin's government is no model of democracy, the stationing of NATO troops next to its border violates Russia's security and stokes the conflict. He also said that the Ukrainian government's bombing of rebel areas has led to a severe humanitarian crisis, with hundreds of thousands of refugees flooding into Russia—a humanitarian crisis that the West has ignored. During the NATO meeting, while Western leaders were calling for more troops in the region and more sanctions against Russia, the government of Ukraine and the pro-Russia separatists were actually talking peace. 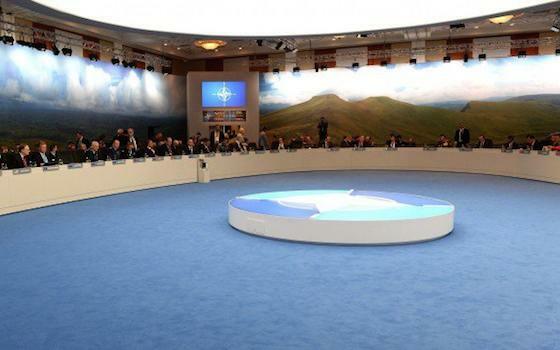 In fact on the last day of the Summit, NATO leaders were surprised when Ukraine's president announced a ceasefire. But instead of being greeted with cheers, NATO leaders treated the announcement as a distraction and vowed to push ahead with new sanctions. "I don't think we want to be distracted from our determination to impose further sanctions in response to Russia's major military adventure into Ukraine by these noises off about a possible ceasefire," said UK foreign secretary Philip Hammond. Why be distracted by a ceasefire, or put energy into promoting a non-violent solution to the conflict in Ukraine? NATO, after all, is a military alliance and—as the saying goes—when all you have is a hammer, everything looks like a nail. Medea Benjamin is the co-founder of the peace group CODEPINK and the human rights organization Global Exchange. She is the author of Drone Warfare: Killing by Remote Control . "Ukraine: Red Meat for the NATO Alliance"